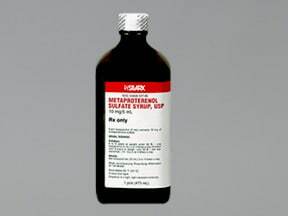 What conditions does Metaproterenol SULFATE treat? Tell your doctor right away if any of these unlikely but serious side effects occur: fast/pounding/irregular heartbeat, muscle cramps, weakness. Seek immediate medical attention if this unlikely but serious side effect occurs: chest pain. List Metaproterenol SULFATE side effects by likelihood and severity. This medication should not be used if you have certain medical conditions. Before using this medicine, consult your doctor or pharmacist if you have: certain types of heart rhythm problems (cardiac arrhythmias with tachycardia). Before using this medication, tell your doctor or pharmacist your medical history, especially of: heart disease (e.g., other abnormal heartbeat, ischemic heart disease, high blood pressure), seizures, overactive thyroid (hyperthyroidism), diabetes. What should I know regarding pregnancy, nursing and administering Metaproterenol SULFATE to children or the elderly? Does Metaproterenol SULFATE interact with other medications? 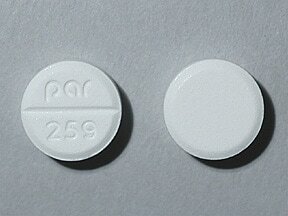 This medicine is a white, round, scored, tablet imprinted with "par 258". 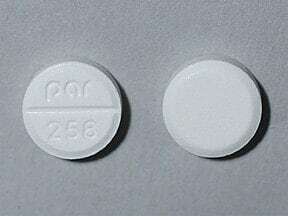 This medicine is a white, round, scored, tablet imprinted with "par 259". Are you taking Metaproterenol SULFATE? Are you considering switching to Metaproterenol SULFATE? How long have you been taking Metaproterenol SULFATE?